Before the lesson, students attempt a task individually. You review their work and create questions for students to answer in order to improve their solutions. A whole-class introduction poses the problem of finding the areas of ‘tilted squares’ drawn on a square grid. Students share different approaches for calculating areas and are offered three generalizable methods that they might use. 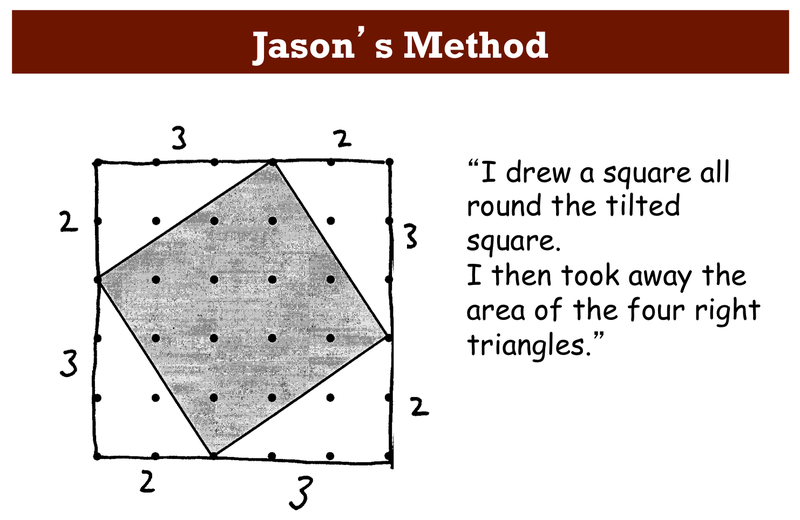 Students are asked to find possible areas of ‘tilted squares’ at a specific tilt. This requires a systematic approach. In a whole-class discussion results are shared and organized. Each student will need a copy of the task sheets Square Areas, Tilted Squares, Proving the Pythagorean Theorem, Square Areas (revisited), and multiple copies of the Dotted Grid Paper (on demand). Each small group of students will need copies of the sheet Some Different Approaches. There are projector resources to help introduce activities and support whole-class discussions. 20 minutes before the lesson, an 80-minute lesson (or split into two shorter lessons), and 20 minutes in a follow-up lesson (or for homework.) Timings given are only approximate. Exact timings will depend on the needs of your class.